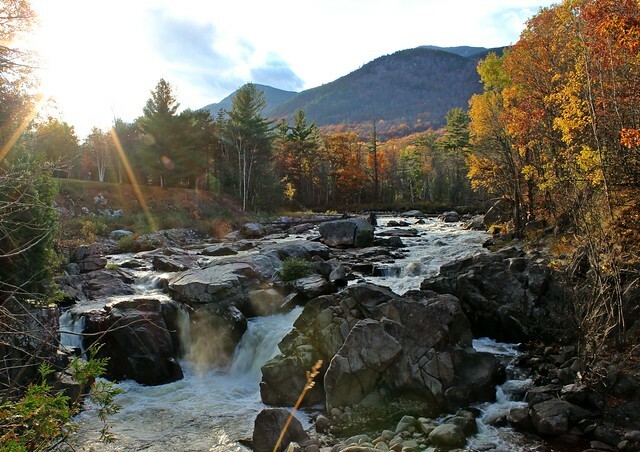 The story of the Adirondack Park is one of disturbance and renewal. As with all landscapes, the Adirondacks felt the sting of numerous attempts at colonization throughout the eighteenth and nineteenth centuries, but its rugged landscape and brutal weather patterns discouraged the traditional pioneer ethic. Thus, into the mid-nineteenth century, the forests of this region were largely intact. With lumber resources on the east coast growing scarce, the loggers’ eyes turned to the Adirondacks, the last major unharvested crop of trees in the east, and they got to work. From the beginning, softwoods were targeted because of easy planning, strength, and, most importantly, flotation. The large white pines, an early successional species, grew on the edges of dense forests and near water sources and were thus the first species to be targeted (Schneider). Because white pine comprised such a small percentage of the Adirondack forest, the resource quickly gave way to the spruce, the tree species that hypnotized a generation of loggers. Very quickly, land began to be evaluated by spruce population density and its proximity to water (McMartin 39). Even large tracts of hardwood forest were virtually worthless until a rise in pulp production and transportation via railroads made harvesting these trees commercially viable (Schneider). After decades of severe logging in the Adirondacks, foresters began to run out of spruce to harvest, chasing it up to elevations as high as the tops of Seward Range in the High Peaks (Schneider). Spruce is a shade-tolerant species, meaning that it regenerates best under its own shade (McMartin 40). With almost all valuable spruce removed from large tracts of land in the Adirondacks, the tree’s native range had almost no chance of recovery—a loss not only for the health and diversity of the ecosystem but also for the foresters who hoped to harvest second and third crops on their land. With the largely selective removal of spruce and other soft woods in the late nineteenth and early twentieth centuries, the forest composition of the Adirondacks took on a very different hue, resulting in entirely different systems of plants and animals occupying its understory and canopy. The hardwood forests that now dominate the Adirondack landscape are not necessarily a natural phenomenon. The modern day Adirondack forests comprise a patchwork of recovering, secondary growth forests and pristine old-growth forests. The combination of these different forest types makes the Adirondacks an ecological diverse place, able to support a broad diversity of plant and animal life. Further, the concentration of old-growth in the park (the largest on the east coast) increases the economic and ecological wealth of the Adirondacks. A complicated history of disturbance in the park has selected for a broad distribution of potential old-growth forests. Therefore, the debate surrounding the amorphous definition of “old-growth” has serious implications both in this region and around the world. There are many different estimates for the amount of old-growth forest found in the park, and assessing these approximations represents a great potential for understanding ecosystem function of old-growth and increasing accessib ility of these possible tourist attractions. The wealth of the Adirondacks rests in its large stretches of unbroken, forested wild areas which support large amounts of wildlife and recreation. Therefore, to appreciate the Adirondack Park, one must appreciate the forests and the complex forces that govern their dynamics. In this website, you will find information relating to the ecological force of succession, a history of natural and anthropogenic disturbance regimes, and a qualification and quantification of old-growth forests in the Adirondacks. This web of interactions governs the fluid composition and application of the Adirondack forests: “forever wild,” and forever changing. McMartin, Barbara. The Great Forest of the Adirondacks. Utica, NY: North Country, 1994. Print.